College Football Playoff Update: Is TCU A Lock? Safety Derrick Kindred of TCU scores on a 44-yard touchdown interception during TCU’s game Saturday against Iowa State in Fort Worth, Texas. TCU was ranked No. 3 in the college football playoff selection committee’s rankings entering the weekend, and as expected, it demolished Iowa State on Saturday afternoon. But the enormous margin of victory — 55-3 — isn’t quite as impressive considering the meager quality of the opposition (Iowa State finished its season 2-10). Still, the math might seem to be straightforward. TCU isn’t going to be demoted two positions in the rankings and lose its playoff spot after such a dominant performance, is it? What if No. 5 Ohio State and No. 6 Baylor also win? 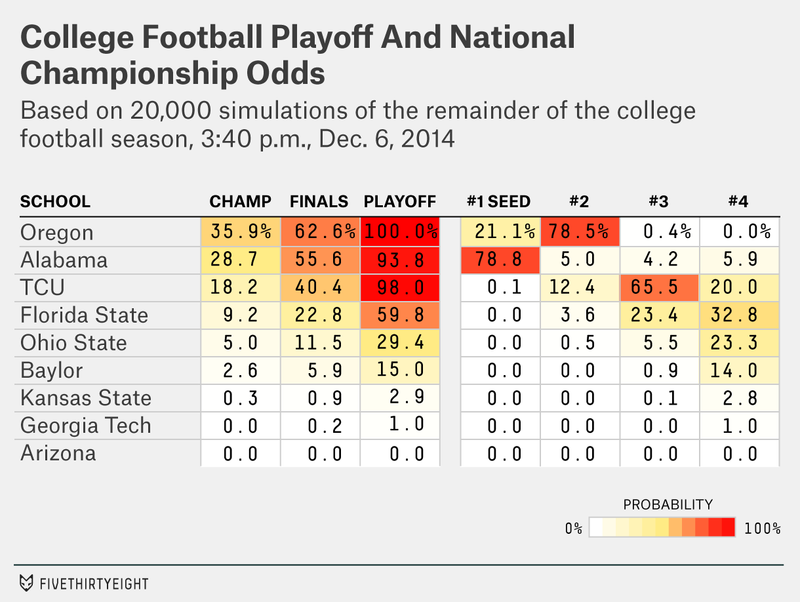 Even then, TCU’s odds would be 96 percent, according to the model. The Horned Frogs aren’t quite as safe as Oregon, but they’re in a pretty flush position — unless, of course, a central assumption in the model is wrong. The assumption is that the committee’s standings will be fairly consistent from week to week; that it won’t, for example, suddenly give more emphasis to Baylor’s head-to-head win over TCU after indicating earlier that other factors outweighed it in TCU’s favor. We make that assumption because that has historically been true of voters in the Coaches Poll. Because the playoff committee is new this year, the record of the Coaches Poll is the best approximation we have available. And indeed, the committee has mostly behaved like the Coaches Poll and media polls so far this year. True, it may reward slightly different factors — putting more emphasis on quality wins and “game control,” for instance. But it hasn’t reshuffled its standings drastically from week to week without a good reason. Maybe Ohio State and Baylor could give the committee a good reason? If they also win their games, they’ll have done so against much better opponents (No. 13 Wisconsin and No. 9 Kansas State) than the one TCU just faced. In fact, the model assumes that the committee would potentially give a little more credit to Ohio State’s and Baylor’s wins, especially if they came by clear margins. It just doesn’t think it’ll give them enough extra credit to allow them to leapfrog the Horned Frogs. It might be a different story if TCU had started the weekend ranked No. 4 instead of No. 3. But the extra breathing room the committee gave to TCU makes it a lot safer, at least in the model’s estimation.